The global expansion of emerging market multinationals has become one of the hottest trends in international business circles over the past decade. Typically, these firms started out small but have internationalised in a rather accelerated fashion. Originating from a wide variety of industries including resources, IT, consumer electronics and pharmaceuticals, their expansion has come primarily via the acquisition route. This has seen them accessing mainly developed economies and buying out existing technologies, brands and companies in those markets. The reason for this strategy is simple. Unable to develop many technologies for themselves due to a lack of homegrown resources, going out and buying it represents the most expedient way forward. Interestingly, this type of expansion strategy differs significantly from those employed by the older, established Western multinationals, which were more likely to favour collaborative partnerships as a means of growth. So, is this drive to internationalisation through acquisition a positive or negative for these emerging market dynamos? At this stage, the jury is still very much out. That’s because many of these international expansions have not been implemented long enough for the true nature of any profitability impacts to become apparent. In reality, I believe we’ll need at least a decade before the full ramifications can be assessed. 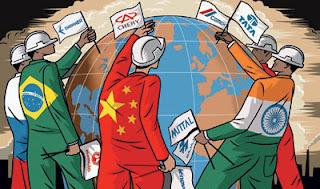 For already established companies, however, I would say this tendency of emerging multinationals to acquire often generates negative short-term consequences, with the resulting increased competition for a finite pool of resources and talent creating the usual associated challenges. On the other hand, the push to acquire may actually provide opportunities for some established organisations to partner with these emerging market companies, to form alliances and benefit from an association. This could lead to joint collaborative projects in terms of developing new products and processes that perhaps would not have otherwise emerged.